Located on the back side of the First Congregational Church in Riverside, California is its parsonage. After capturing this image I almost had the urge to donate some paint to the church, but I don’t think I could afford the amount of paint that would be necessary to spruce up the parsonage, and then it would no longer make such an interesting subject. I applied some painterly effects to this image using Alien Skin Snap Art. 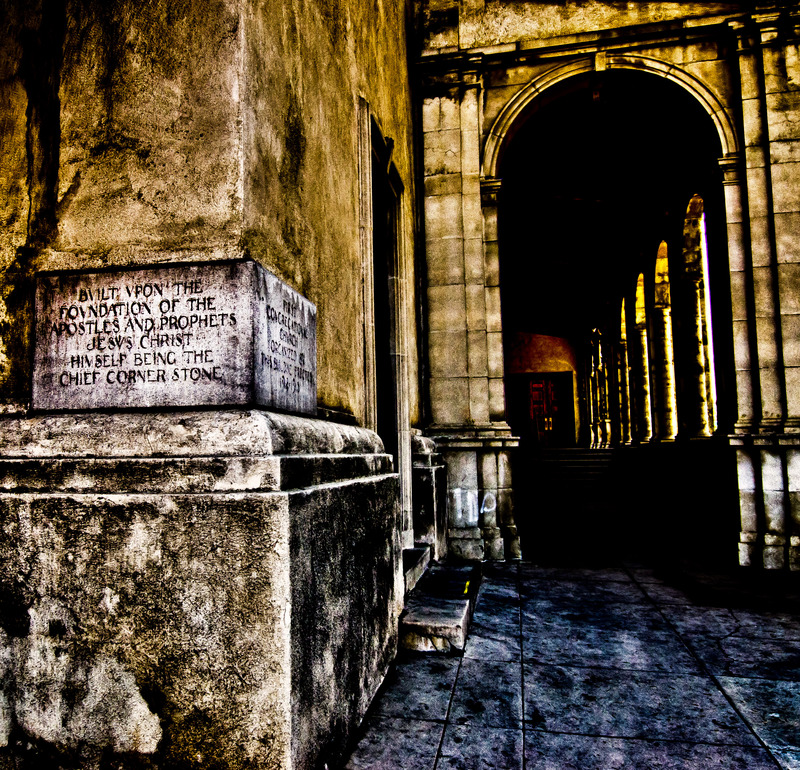 Just beyond the cornerstone is this colonnade that leads to the chapel doors of the First Congregational Church in Riverside, California. It can get quite warm in Riverside and this passageway gives me a sense of the coolness that can be found in its shelter, and within the stone church building. I purposely darkened the walls an columns and emphasized the warmth of the two sets of doors, and then also added blur to defocus on the sunny landscape just outside of the scene. I really like the overhead beams and the doors in this scene combined with the perspective and selective focus. The cornerstone at the First Congregational Church in Riverside, California was laid on December 1, 1912 and has remained in place with the completed building for 99 years. While I did take some liberties in terms of emphasizing the grunge when rendering this image, the building in real life does look almost as worn as it does here. I don’t know if that is a factor of the material used to construct the building or not, but I would expect this kind of “wear” to be present on a building that is five centuries old, but not just under a century as in this case. This building and the adjacent parsonage (which I will share later in the week) has a lot of character which is what attracted me to it and I find cornerstones very interesting. This cornerstone certainly seems to express the beliefs of those who laid it and utilized the finished structure. It does seem very appropriate if you subscribe to the beliefs, in this context. 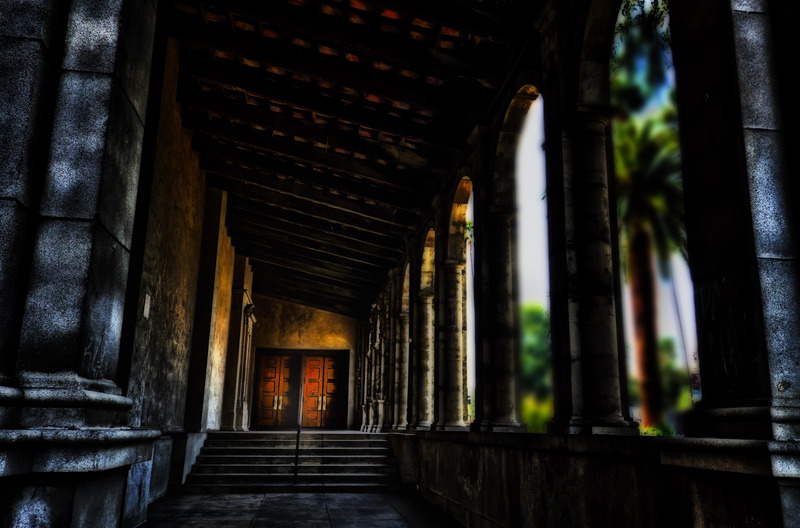 The present church building is one of the most significant Spanish Revival structures existing in Southern California. 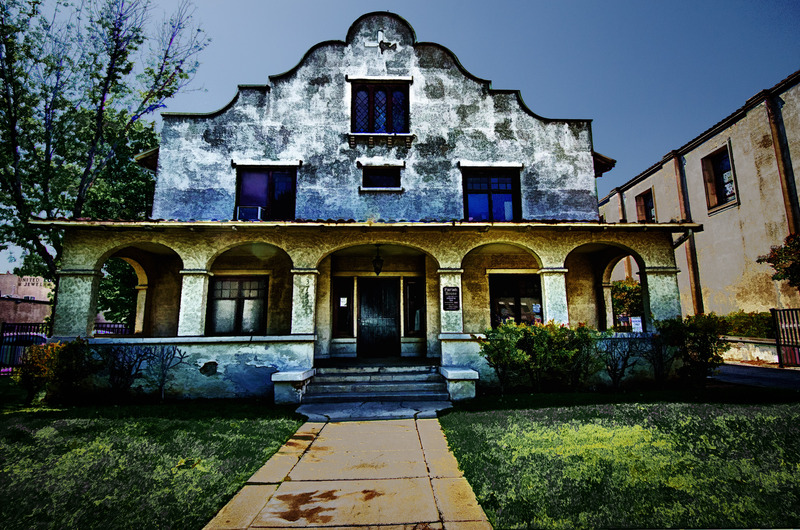 It was designed by Myron Hunt, a leading California architect who also designed the Spanish Wing of the Mission Inn and the Rose Bowl in Pasadena. For many years the church’s 135′ bell tower was empty. in 1986, Don and Beth Miller began the Carillon Project in memory of their son, Scott. A Carillon was chosen, consisting of 24 bells, each of which rings a different pitch on the chromatic scale. 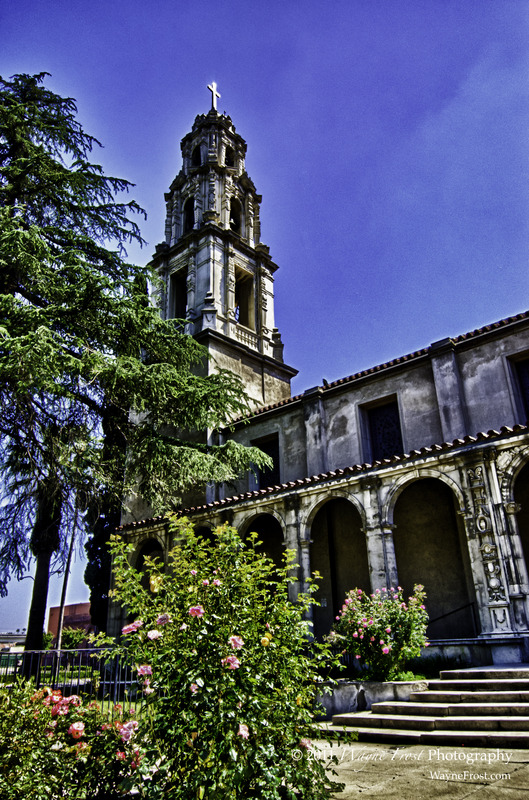 The bells, which are the only pealing bells loacted in Southern California, were manufactured in France. In August 1989 installation began, and on October 1, 1989, the bells were dedicated as a memorialto loved ones and a gift of the church to the community. The sound of the bells was quite appealing and imparted a sense of well being while we were in the neighborhood. Processing for this image was fairly straightforward, I did amp up the saturation in the flower blossoms.